Mercurey is really quite extensive, with 646ha, of which 168ha is premier cru. (To put his in context, Meursault, a big village, covers 439ha. Puligny-Montrachet, one of the smaller ones, 220ha.) The vines lie north of the road that connects Chalon and Autun, and also to the south, in the village of St-Martin-sous-Montaigu. The latter produce firmer and more rustic wines than the former. 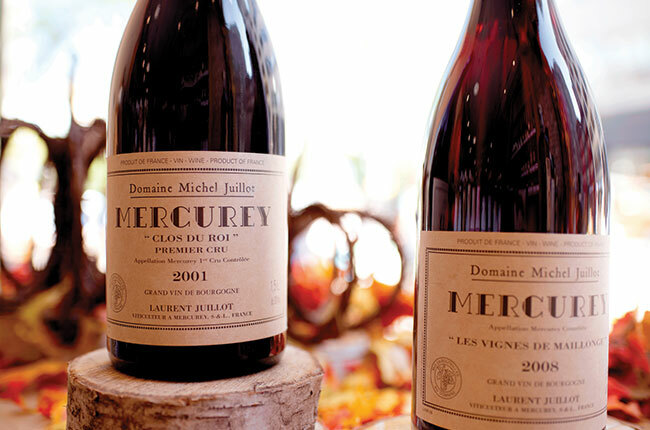 Overall we find more volume and, at their best, more depth than in Givry – as such, wines from Mercurey are marginally more expensive. There are 32 premiers crus. The best of these are Combins, Champs Martin, Clos des Barraults, Les Naugues and Clos l’Eveque, from north of the village, and Clos de Roi and En Sazenay from the other side. As in the Côte d’Or, you will find these in mid-slope. Whole-cluster vinification. Gently oaky, allowing sumptuous ripe cherry fruit to flood out. Has grace and persistence. This is a classic. Quite firm but expansively rich. Very good grip. Profound and complex. Splendid, rich, concentrated fruit. Abundant and harmonious. A fine, classy wine. A blend of five of the estate’s premiers crus, assembled at the end of their maturation. Rich, fat and opulent. There’s plenty of fine new oak here.